As I’m sure all of you know, I’m a bit of a Throne of Glass fangirl. It’s one of my favourite series of all-time and I spend the majority of time either thinking or talking about it. You can imagine how excited I was for this book and I probably don’t have to explain my reaction when Chami told me we’d been sent an ARC from Bloomsbury Australia. Yes, it took me a little while to get to it and yes, it has been published now but I have trust issues when it comes to Sarah J Maas novels. I know that they are going to tear me apart, and this was no exception. I was a little hesitant for the first 30 or so pages — I haven’t had the best history with fae books or retellings so I was a little nervous. I can’t pinpoint the moment where I fell in love, but all I knew was that I was suddenly on page 160 before I knew it. I absolutely loved the world. Quite a few fae books I’ve read revolve around courts, especially to do with the seasons but I loved Sarah’s take on it. I tripled checked to make sure this wasn’t a spoiler, but the members of the court that our main character is in wear these masks as the result of a curse — Can we talk about how amazing this is? This was honestly one of my favourite parts of the book (and I have a lot of favourite parts) because of how unique it is. 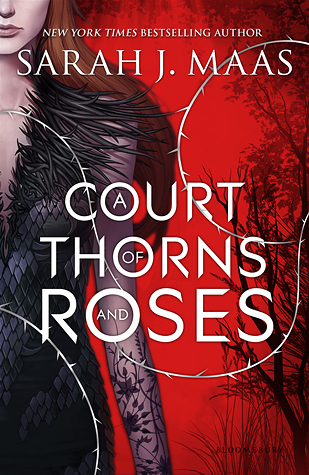 I was talking to Chami a few hours ago about this book, and she mentioned how quite a few of the reviews she’d read talked about how they thought Feyre, the protagonist, was annoying. I actually really liked Feyre. Firstly, her name is awesome — Sarah is just the best at fantasy names. Secondly, I really like how she grew and adapted throughout the novel. In the start, she was naïve and proud and honestly, kind of dumb but by the end, she had this new strength to her (I’m only focus on the mental strength here) that I really admired. She’s no Celaena, but honestly, who is? I admit that I totally prefer the male characters in this than those in Throne of Glass. Don’t get me wrong, I like Chaol and Dorian but Celaena will always trump them. In this, however, I have to say that I really really love the three main male characters — Tamlin, Lucien and Rhysand. I can’t pick a favourite (yet), but I just really love them all and I can’t wait to see where Sarah takes them. This is the part where I cry over the fact that I don’t have anymore Sarah J Maas books to read until September. How am I going to survive this? Thank you Bloomsbury Australia for sending us a copy of this book for review and for ultimately ruining my life.